Water plays essential roles in hydrating a calf and also in rumen development. Baby calves are on a liquid diet, so it may seem that offering water is not necessary, but that is not true. Offering water separate from milk will increase weight gains by increasing dry feed intake. According to the National Dairy FARM program Animal Care Manual Version 3.0 (2016), best practice is to provide calves access to clean, fresh water from the first day of life. However, according to the National Dairy Health Monitoring System (USDA, 2014), the average age of heifers when first offered water in the United States is 17.3 days. The age when first offered water tends to go down as herd size increases (see table), however no category of herd size is (on average) offering water the first day of life. One very important role that water plays is in rumen development. When a calf drinks water, the water goes into the rumen, as does the starter feed. Milk, fed from bottle or bucket, by-passes the rumen via esophageal groove, and is deposited into the abomasum of the calf. Water in the rumen provides a medium for ruminal bacteria to live in. To ferment grain and hay, rumen bacteria must live in water. Without water ruminal development is slowed. In 1984, the Journal of Dairy Science published a study examining the growth, health and starter intake of calves fed free choice water, or no water throughout the milk feeding period of only 4 weeks. Prior to this study, it was not common to offer pre-weaned calves water. The researchers found that when no fresh water was offered, starter intake was 31 percent less and weight gain was reduced by 38 percent. Offering fresh water is particularly important in situations where milk total solids are high (under 15 percent). High total solids in milk or milk replacer can create a situation where the osmotic balance in the calf is out of equilibrium and water is pulled out of cells resulting in diarrhea and dehydration, even in a calf drinking plenty of milk. Providing fresh water will allow the calf to self-adjust to some degree, lessening the severity of dehydration. It is commonly thought that calves prefer warm water over cold water. This theory was verified in a Finnish study published in the Journal of Dairy Science in 2011. The study found that water consumption of pre-weaned calves was higher in calves offered warm water compared with those offered cold water. 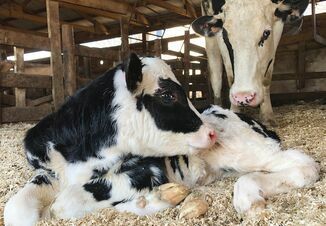 However, the increased water intake of the calves offered warm water did not equate to increased weight gains, although it is important to note that calves were raised nutritionally very different than typically seen in the United States. It is worth considering starting baby calves on warm water to encourage water consumption. A final note on water for calves is to ensure the quality of the water. Michigan State University Extension recommends periodically testing water sources for bacteria and mineral content. In general, livestock guidelines provided with water analysis are applicable to calves with the exception of sodium. 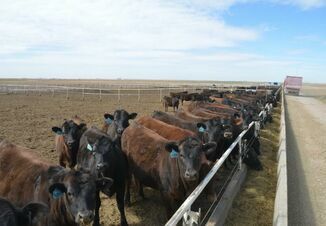 Calves are very sensitive to sodium and do not tolerate excess sodium well. Water that has passed through a water softener can have very high concentrations of sodium and should not be used to mix milk replacer or used as a source of drinking water unless it has been tested and verified to have low levels of sodium (‚â§ 100 ppm). In addition, keep water buckets free from environmental contamination - dirt, feed, manure, algae. Researchers out of Utah State University found increased daily gains and weaning weights when water buckets were dumped and rinsed daily compared to weekly or every 14 days. It is helpful to have a divider between the water and starter buckets in the calf pen so that the calf cannot slop back and forth between buckets. Water is essential to raising healthy calves. Ensure that it is clean, fresh, and always available beginning at an early age to get the best growth and health of your future herd.